Doing business facing the current global financial crisis has increased our attention to cost savings including those related to trademark application process and registration. Before starting the application process you have to identify the countries/geographic area where you wish to sell/commerce your products and/or offer your services. If you wish to register your trademark in Italy you can file/(fill out the application form) your application at your nearest Camera di Commercio Office or online at UIBM (Ufficio Italiano Brevetti e Marchi) website via/adding your Italian digital signature. If you wish to register your trademark in the European Union you can file your application online at the EUIPO (European Union Intellectual Property Office) website. Filling out the registration form (paper or digital one) including: owner’s data, trademark details, related list of goods and/or services. Paying the trademark office fees. Once you filed your TM application you have to wait the Trademark Office exam (from one week to several months) according to relevant current Law. If no objection comes out your trademark will be officially published, otherwise may be refused and fees lost. That means if you don’t identify clearly and precisely all the required trademark information previously, nor you are aware about relevant legislation, you may risk to afford an increase in costs and even the rejection of your application. Once published and during the following 3 months, the owners of previous identical/similar trademarks may file an opposition against your registration. It is crucial to know that the Italian and the EU TM Office do NOT perform any previous check about identical and/or similar marks. It is the owners of previous trademarks that may file the opposition. If the opposition is estimated because of your trademark has been considered confusing similar to the opposition trademark, your trademark application will be rejected, and fees lost. You can ask to a lawyer/solicitor to represent you in the trademark application process requesting in advance to him a quote which includes: the required fees for your application and the fees for his legal advice. a Power Of Attorney (POA) allow him to represent you in the application procedure. Beware many websites that do not require POA because they act as rubber-stamping and do not act as lawyers representing you as applicant. Analysis of the registration requirements in order to limit the risk the application may be rejected by the Trademark Office. Legal examination of classes of goods and\or services to be claimed in the trademark application. The classes identify precisely the trademark legal protection area. The goods and/or services must be indicated clearly and precisely, specific enough to identify the nature of products and/or services, and not limited to the class title. Trademark search in the official databases in order to limit the risk the mark can be opposed during registration by previous trade mark owners. Such a search is also crucial to limit the risk that you may be condemned for counterfeiting. 1. Risks of the application. 2. Legal advice to avoid many potential disputes. 3. Recommendation to better protect the mark. Accordingly, upon your confirmation to proceed, the lawyer files the application in front of the trademark office and monitors/supervises the application process up to the granting of the Certificate of registration. A specialized lawyer/ trademark attorney can help you before, during, and after the trademark application process, including policing and enforcing any trademark registration that may issue. Filing an application on your own, apparently is a cost saving because you have to pay ‘only’ the application fees for registration. 1. drafting and filing observations in reply to TM Offices provisional refusal. 1. replacing your trademark over your products, and any reference of its in advertising, websites, signs, as a consequence of a trademark infringement. 2. registering a new corporate name / sign / web site as a consequence of a trademark infringement. COMPENSATION for damages as a consequence of a trademark infringement. FINES as a consequence of a trademark infringement. We desire to alert European trademarks’ Owners that are receiving requests of payment related to its European trademark registrations. We strongly remember the EUIPO (European Union Intellectual Property Office) is the only official public body and it NEVER send you any request of payment. If you proceed with the payment to third parties, you definitely risk losing your money and your trademark rights. On that respect, we recently undertaken an administrative action on behalf of a Company who paid an invoice released by RMI – Rinnovo Marchi Italiani Srl, a fake Italian trademark renewal service. In January 2017, following our complaint, the Italian Competition Authority (Autorita’ Garante della Concorrenza e del Mercato – AGCM) found RMI guilty of misleading advertising and sentenced them to pay a fine of 20,000 Euros. We desire to underline that AGCM is an administrative Court and it does NOT allow the refund of the amount paid. Accordingly, the only way to get the refund back it taking legal actions in Court. In the absence of any legal action there is a risk that RMI, as other companies engaged in these illicit activities, could continue to defraud businesses who pay these invoices. We strongly recommend you to pay attention if you receive any communication about your trademark. Please remember to read the invoices carefully, because it is often issued as an official-looking invoice with the details of the brand and the company owner. Remember that data relating to trademarks are public and freely accessible by all. You may find a list of some 102 companies that are currently sending such misleading invoices, here. If you have any doubts about any communication you have received regarding your trademark, please feel free to contact us at info@europeantrademark.it or call us on +39 06 97602592. The Office for Harmonization in the Internal Market (OHIM) has released the “Annual Report 2013” containing updated information and developments on its activity. The report shows that the Office received more than 114.000 Community trademarks (CTM) applications during year 2013, which is 6% higher than in the previous year 2012 and double the growth figure assumed in the Work Programme. The increase in CTM applications in 2013 is very positive in particular if we refer the continued impact of the economic crisis which affected many countries in and outside the UE. In this regard, OHIM’s top ten applicant countries in 2013 were, in order: Germany, USA, UK, Italy, Spain, France, Switzerland, Netherlands, Austria, Poland. In particular, we underline that these countries accounted 76% of all CTM applications in the year 2013. The report also refers that the number of oppositions filed against the registration of the Community TradeMarks in 2013 have been 17.000. However, it has been substantially stable compared to previous three years, the No of opposition filed proves the critical role of the trademark search that have to be performed before filing the trademark application. On that respect, the only way that applicants have to limit the risk to infringe third parties’ trademark right, and to avoid the risk to be sue in Court for trademark infringement and to receive oppositions, is to properly do a trademark search aimed to carefully and legally evaluate prior trademarks rights. The report also refers about the new OHIM’s website that has been launched on 2 December, as a major stepping stone in achieving the Office’s goal of developing a fully-fledged e-organization. It have been so reported the new e-resources of the website focused on an improve security system, new functionality and new features that will improve the efficiency of the Office and will reduce the costs for applicants. On 30 September 2013 the European Commission launched a study on Intellectual Property Rights, which was carried out jointly by the European Patent Office (EPO) and the Office for Harmonization in the Internal Market (OHIM). The study “Intellectual Property Rights intensive industries: Contribution to economic performance and employment in Europe” measured the real contribution of Intellectual Property (IP) rights in the EU economy. The main findings of the study are that about 39% of total economic activity in the EU (worth some €4.7 trillion annually) is generated by IPR-intensive industries. Such IPR-intensive industries are shown to generate almost 26% of all jobs in the European Union during the period 2008-2010, with almost 21% in trade mark-intensive industries. The study also finds that approximately 26% of all employment in the EU (56 million jobs) is provided directly by these industries, while a further 9% of jobs in the EU stems indirectly from IPR-intensive industries. IPR-intensive industries also pay significantly higher wages than other industries, with a wage premium of more than 40%. This is consistent with the fact that the value added per worker is higher in IPR-intensive industries than elsewhere in the economy. As regard Trade mark-intensive industries the study reveals that they employed a total of about 63 Mln. people in EU, of which almost 45,50 Mln. of direct employment and almost 17,60 Mln. for indirect employment. Moreover, as regard the contribution of the Trade mark-intensive industries to the Gross Domestic Product, they account for 4,163,527 Mln. Euros representing 33.9% of the total share of the European Union GPD. Finally, the study reveals that 90% of EU export is accounted for by IPR-intensive industries where trademark-intensive companies account for 75,5% of the total export share. OHIM, The Office for Harmonization in the Internal Market has recently released the “Annual Report 2012″ containing updated information and developments on its activity. In particular, the report indicates a total of 107.927 Community trademarks applications filed in 2012, performing an 1.9% increase compared to 2011. 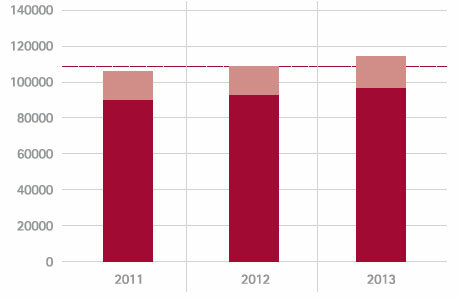 Such raising rate is not so relevant compared to 11.4% and 7.7% registered, respectively in 2010 and 2011, however, it reveal a fairly rate considering the international crisis affected many of OHIM’s top filing European Union Countries. 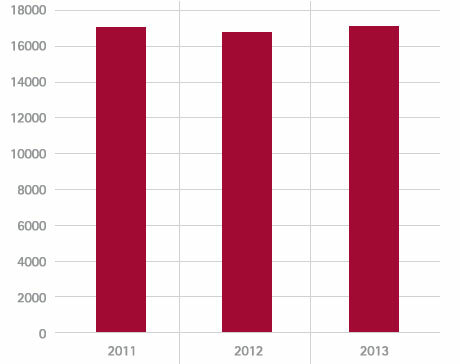 The number of oppositions filed against CTMs have been 16.634 remained substantially stable compared to 2010 and 2011. The cancellations against the registration of Community trademarks were 1.262, with an increment of 163 requests. The report also refers about the developments of the European Trade Mark and Design Network, an interoperable and collaborative network of European IP offices, contributing to a stronger IP environment for users. Two major projects stem from it: the Cooperation Fund, dedicated to building common tools for EU IP offices; and the Convergence Programme, fostering voluntary harmonisation of practices. The Network is aimed to enhance the legal certainty and to reduce the transaction costs for users. - The “application for customs action” (AFA) allowing Community trademarks’ and Design’s holder to submit a form informing EU Customs Authorities on its goods suspected of infringement. - The “Central repository of statistics” aimed to collect, analyse and report data on counterfeiting and piracy in the European Union. OHIM webpage on 2012 Annual Report.